This is a link to the most in-depth and accurate Clan map of Ireland ever produced. It is based on the location of nearly 1,400 Castles with a known historical association with a particular Irish, Scottish, Gallowglass, Norman, and Viking Clan or Family. 1. Park Castle – Northeast of Tuam, Co. Galway. Here the family housed an extensive library and a school of law. 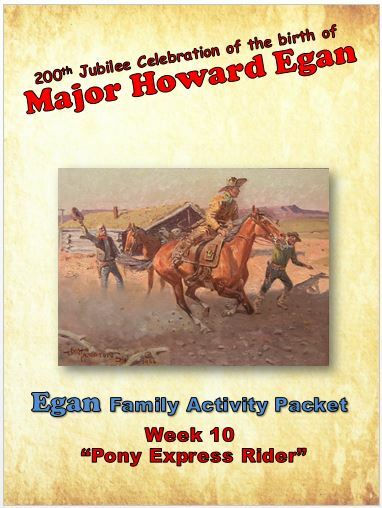 Passing out of Egan hands in the seventeenth century. The castle is now in ruins. 2. Duniry – Northwest of Portumna, Co. Galway; was in use up to the end of the sixteenth century. Duniry is a small village between Tynagh and Abbey, in County Galway, Ireland. Duniry’s most noted landmark was Egan’s castle, now derelict, it flourished from 1450 to 1600. 3. Tullinadaly Castle – Near Tuam, Co. Galway. This property passed into the hands of the Lally family in the early seventeenth century. 4. Redwood Castle – Situated on a hillock near the Shannon, in Lorrha Parish, County Tipperary. 5. Cloghkeating Castle – Near Borrisokane, Co. Tipperary. 6. Drumnamahane Castle – Now ruined. 7. Annamaidel Castle – An Egan Castle in Lower Ormond near Toomevara. Built in 1650. 8. Behamge Castle – Lower Ormond in Rathnaveoge Parish, Co. Tipperary. 9. Kilnalahagh Castle – In Co. Tipperary. 10. Ballynamoe Castle – In Honeymount, near Dunkerrin. 11. Derrymacegan Castle – Near Lorrha. Redwood Castle (also known as Egan Castle or Caislean Choillte Rua in Irish) is a Norman castle near Lorrha in County Tipperary, Ireland. The castle was built by the Normans around 1200 AD, and was occupied by them until c.1350, when the Mac Aodhagáin (MacEgan, Egan, Keegan) were installed on the lands. 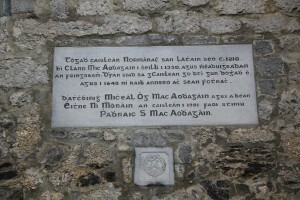 As hereditary Brehons or lawyers, the Mac Aodhagáin clan established a school of learning here, which was patronized by the family for several hundred years. The castle was enlarged and renovated several times, with considerable work in 1350 and 1580. Aside from the original thick stone walls, the building demonstrates some architectural features common to Irish fortifications of the period (including amurder-hole), and some less common features (including aSheela na gig). The castle remained under continuous occupation and ownership by the (Mac)Egan families until it was confiscated and burned at the time of the Cromwellian conquest c.1650. The site remained in ruin, with only the thick exterior walls standing, until Michael J. Egan, a Mayo lawyer, purchased and renovated the building in 1972. While the castle remains a private residence, terms of the Department of Finance Heritage/Cultural Tax Relief mean the castle is periodically open to the public during the summer months. 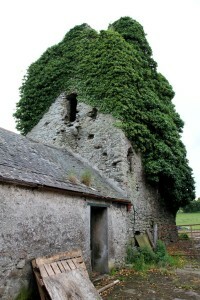 It is a protected structure (ref S329) on the North Tipperary list of protected structures. 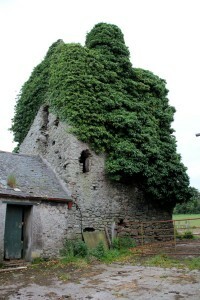 The castle and its townland, called in Irish Coillte Ruadh (Redwood), apparently took their name from the neighbouring wood of Brosnach, although it is possible that the original Irish designation meant ‘the Wood of Ruadhan’, after the sixth-century saint who founded the monastery in Lorrha village nearby. The present castle probably began as a Norman stronghold, erected about 1210. After they drove the Normans from the area in the mid-fourteenth century, the O’Kennedy lords of Ormond turned the Redwood property over to the MacEgan family in payment for services as brehons, or legal experts, and hereditary ollaves, or professors in history and literature. All descendants of a common ancestor, the MacEgans (name in Irish is MacAodhagain, from the diminutive of Aodh, meaning ‘fire’ and anglicized Hugh) were the most important of the Brehon families in Ireland. They began as a prominent sept in County Galway, under the O’Kellys. From perhaps the twelfth century on, they became dispersed, attending to the legal affairs of such chiefs as the O’Conors of Connacht, O’Conor Faly, MacCarthy Mor, O’Carroll of Ely, Fitzpatrick of Ossary, O’Farrell Buidhe, and, after the Hibernicisation of the great Norman lord, MacWattin and the Clanrickard Burke. The branch of the Clan Egan that will concern us here, that of Ormond in North Tipperary, grew in influence under the O’Kennedy patronage and by the fifteenth century at least was, in the words of George Cunningham, “perhaps the most notable learned family in all Ireland”. At Redwood Castle the MacEgans kept a renowned school of law and letters, together with a house of hospitality for scribes, poets and musicians. Undoubtedly, several of the surviving Irish law tracts and parts of An Leabhar Breac (‘The Speckled Book’ of the MacEgans), a compendium in Irish and Latin of the early fifteenth century, were written here. Eugene O’Curry, who had an abiding interest in the manuscript, asserts that the Leabhar Breac is ‘the most important repertory of our ancient ecclesiastical and theological writings in existence’. Echoing his view, Dermot Gleeson calls this largest Gaelic manuscript by a single hand ‘one of the great testimonies of all time to Irish scholarship’. Students were drawn to Redwood and its sister academy at Ballymacegan from all corners of Ireland. Duald MacFirbis, the seventeenth century Sligo genealogist and historian, author of Chronicum Scotorum, studied under the MacEgans, as did Brother Michael O’Clery, Chief of the Four Masters, the team who produced the noted scholarly work ‘The Annals of Ireland’. Some of the history associated with Redwood has been chequered. Not far from the castle in 1602 Donall O’Sullivan Beare made preparations to cross the Shannon during his hazardous march from Glengariff to Breffini in Co. Leitrim after the Irish defeat at Kinsale. His rearguard was attacked by Donough, son of Cairbre MacEgan, owner of Redwood Castle and high Sheriff of Tipperary, who himself fell in battle after a bloody skirmish, his garrison being routed with many losses. In the venerable ruins of the castle, the outlawed James Meaney, the Bold Captain, sought refuge after the 1798 Rebellion. His place of concealment, a small chamber high in the thickness of the castle wall, can still be seen today. At one point Redwood even served as a racing stable and according to local tradition, produced a Derby winner. As late as 1976, the ground floor of the castle was being used as a cow byre. The restoration began with the construction of a slate roof. 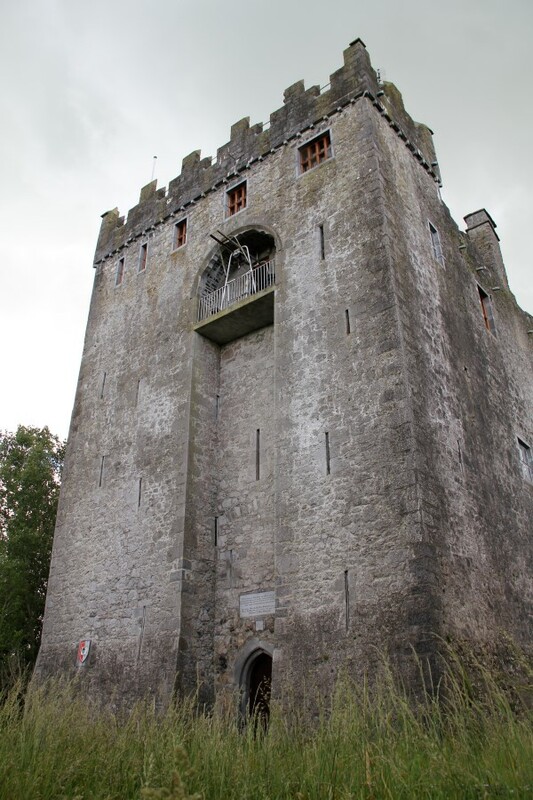 Twelve hundred tons of stone – Liscannor, Kilkenny rock face, Tullamore limestone – have gone into the castle, which is nearly ninety feet high and has walls measuring as much as nine feet in thickness. Nine-foot high crenellations in the Irish style surround the roof; the five storeys beneath are now floored and plastered and the new windows have diamond-shaped leaded panes. The old fireplaces have been made serviceable. On the south side of the hall is the minstrel gallery; on the other is a balcony leading to three bedrooms and a bathroom. The beams of the hall are old Wicklow oak obtained from a Russian emigre in Dublin. Indeed, Irish oak has been used throughout the castle. The second floor now houses a small oratory. Floodlights encircle the castle, so that at night it can be seen for miles around. In 1978 Canon Ryan discovered on the front gable of the castle under the newly constructed Roman arch, a Sile-na-gCioch, that is, a carved stone female of grotesque appearance, reputedly possessing talismanic powers. Redwood’s Sile, a fine example measuring two feet long by one foot wide, had been long hidden by overgrowth. Michael Egan chose his profession as lawyer because he wanted to maintain a continuity between himself and his Brehon ancestors. When he first saw Redwood Castle it was an ivied ruin; but he had a vivid sense of the vitality of all that had happened within its walls and a vision of its restoration to dignity and purpose. He has revived Redwood’s reputation as a house of hospitality. The first function held in the castle in over three hundred years was a luncheon for Mayo lawyers on 14 June, 1981. On 1 May, 1982, Redwood was the setting for the launching of a reprint of Father John Gleeson’s History of the Ely O’Carroll Territory (I915), a valuable account, long out of print, of the area where the castle is located. 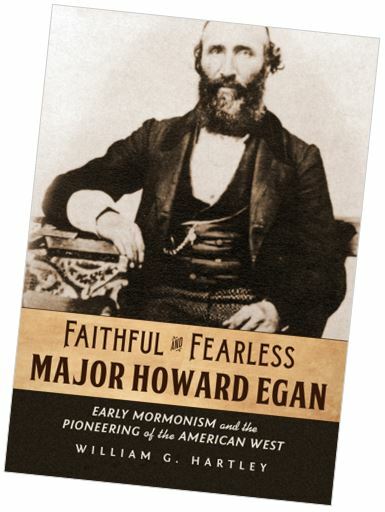 Finally, on 7 August, 1982, Michael Egan hosted the first Clan Egan gathering held in modern times, when approximately three hundred of his kinsmen elected him their chief. 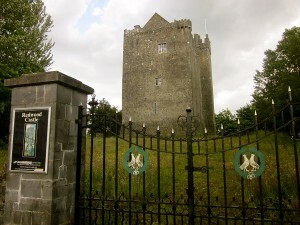 Redwood Castle, situated on a hillock near the Shannon, in Lorrha Parish, County Tipperary, is unique because it again belongs to a member of the family that held it until the mid-seventeenth century. The ancient mansion of MacEgan as John O’Donovan calls the tower house in the Ordnance Survey Letters. 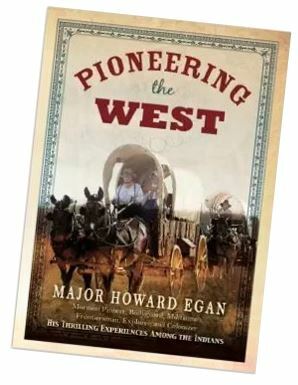 Redwood is now the home of Michael J. Egan of Castlebar, County Mayo, and his wife, Eithne Moran Egan. ln 1972 Egan bought Redwood, then roofless and overgrown with ivy from the late Michael Kennedy, the owner of the surrounding farmland, and began to restore the castle as a private residence for his family. In charge of the renovation was Patrick J. Egan, cousin of Michael Egan. By 1981 Redwood was once again more habitable—now with central heating, electricity and running water. Redwood Castle was originally constructed around 1210 by an Anglo-Norman family by the name of De Cougan. Redwood’s strategic position was of the utmost importance owing to its close proximity to the River Shannon. The Anglo-Normans made several attempts to cross the Shannon and administer the west of Ireland, but none were successful enough to allow the invaders to settle on a permanent basis. As a result, the Anglo-Normans faced the constant danger of being attacked themselves from across the Shannon, leading to a long line of castles and towerhouses being constructed along its eastern bank. The original structure here at Redwood was only two storeys tall, and there were no entrances or exits here on the ground floor for security reasons. The original doorway would have been on the second floor, accessible by a retractable ladder. The main entrance you see today dates from the mid-1300s. For many years ivy covered all of the castle except this doorway, and so a lot of tourist material still mistakenly dates the entire castle from this period. The De Cougans eventually vacated Redwood, and the castle was granted to the O’Kennedy family in 1350. It was then that the other floors were added to the castle. The local branch of the O’Kennedy family were based in Lackeen Castle, approximately 3 miles south of here, and so they turned this castle over to their chief bardic family, the Mac Egans. The bardic families played a crucial role in medieval Ireland, serving Gaelic chieftains and English lords alike. They fulfilled many functions, including those of advisors, administrators, lawyers, musicians, poets, physicians and ambassadors. However, each individual family tended to specialise in just one or two specific areas of study. The Mac Egans of Redwood were experts in historical study and the practice of the ancient Irish Brehon law. Only seven families in medieval Ireland practised and studied this ancient legal system. Most of these served only one master, whilst the Mac Egans served at least thirteen lords and chieftains, giving them a virtual monopoly over medieval Irish law. They founded a school of history and law here at Redwood, and some of Ireland’s foremost medieval thinkers had close links to this centre. Michael O’Cleary led a team of historians which compiled the famous Annals of the Four Masters, an enormous and comprehensive text which gave an account of all recorded Irish history up until the early seventeenth century. Upon its completion, Michael O’Cleary brought the text to some of the most influential men in the country, including the Archbishop of Dublin and the Bishop of Tuam. However, the first approval he sought was from a Flann Mac Aoghain, one of his former teachers and the lord of Redwood Castle. However, by this time, Redwood Castle had reached its apex, and its decline began with a tide of political and religious unrest which culminated with Oliver Cromwell’s invasion of Ireland in 1649. 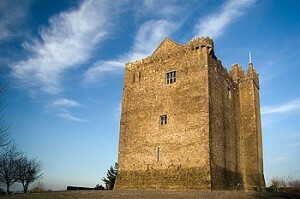 The development of artillery effectively ended the reign of castles and towerhouses in Ireland, which had previously only had to deal with the occasional uprising by poorly armed peasants. Nearby Lackeen Castle was forfeited to Cromwell’s troops in 1653, whilst records of 1654 state that by that date, the castle at Redwood was nothing more than a ruin. It therefore seems likely that Redwood was besieged sometime in 1653. There are no obvious signs of damage from heavy artillery on the outside of the castle, and therefore it seems likely that the castle was forfeited without a fight once the Mac Egans saw what they were facing. Whatever the circumstances of the castle’s seizure, we do know that once it was in the possession of Cromwell’s troops, it was fired and practically burnt to the ground. The roof and most of the floors were wooden, and so only the walls and the spiral stone stairway were left standing. The castle remained in ruins for over 300 years. At the turn of the twentieth century, a local farmer cut a second opening into the ground floor, just wide enough to let through a horse and cart which could be sheltered from the elements under the stone-barred vaulted arch. It is believed that it took three men a fortnight to cut through the 11 foot thick western wall. In 1972, a lawyer from Castlebar, County Mayo by the name of Michael Egan bought Redwood Castle and undertook its restoration. He was a descendant of the Mac Egans of Redwood, and so was determined to restore his family seat to its former glory. The government refused to support the project with any grants, believing the ruins to be beyond redemption. 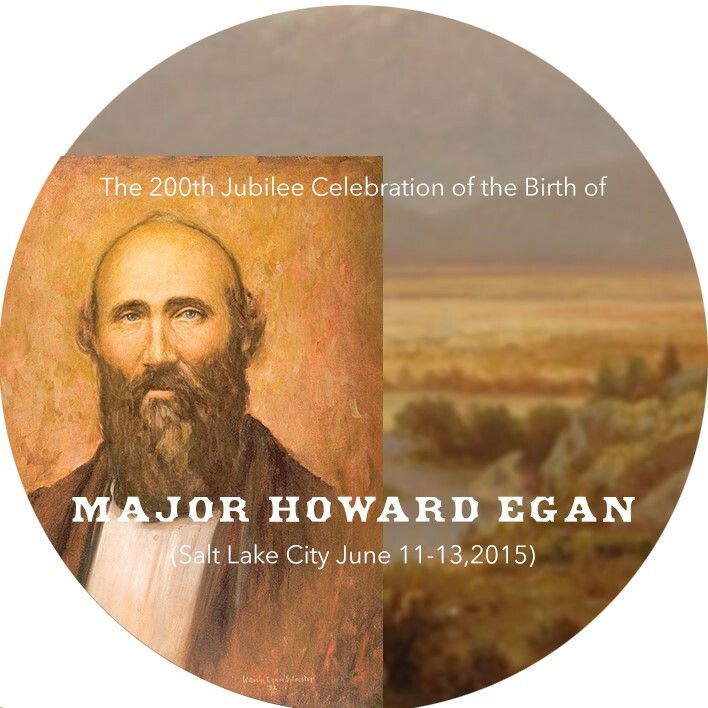 Michael Egan therefore funded the entire restoration project out of his own pocket. His ultimate goal was to have the castle as a second family home, which could also be used for important family occasions. To avoid tax burdens, the castle was opened to the public for sixty days a year as a site of historical interest, beginning in the early 1980s. O’Donovan gave the exact proportions of the castle while it was still a ruin. According to him it was built, probably, about the mid­dle of the reign of Elizabeth, 1580; which makes its age about four hundred years. It was built by Mac Egan, who was a gentleman of high respectability in those days. A celebrated school of law and history was kept in this castle in the reigns of Elizabeth and James I, sixteenth and seventeenth centuries. It was in this school that Michael O’Clery, the chief author of the Annals of the Four Masters, and Duald MacFirbis, the author of “Irish Genealogies”, received their early education. It was near this castle also that O’Sullivan Bere effected a passage across the Shannon, during his historic march from Clengariff, after the siege of Dunboy Castle in Kerry on his way to the North. After the rebellion of 1798 the ruins of this castle became the retreat of a celebrated outlaw, James Meany and his associates, whose exploits are still remembered in the neighbourhood. Although O’Donovan has been quoted as the man who put the date of around 1580 on Redwood, there is quite an amount of evidence to show that this is in fact a very late date and probably refers to a later reconstruction of the building. There was certainly a castle here pre 1200 A.D. This wooden Norman structure was destroyed by the O’Briens in 1207. The Normans rebuilt it, stronger and stayed in it until 1350 when the O’Kennedys evicted them.